For the airport in Avalon, Catalina Island, USA, see Catalina Airport. Avalon Airport (IATA: AVV, ICAO: YMAV) is an international airport located in Avalon in the City of Greater Geelong in Victoria, Australia. While located outside the Melbourne metropolitan area, it is the second busiest of the four airports serving the state capital in passenger traffic. It is located 15 kilometres (9 mi) north-east of the Geelong CBD and 50 kilometres (31 mi) south-west of the Melbourne CBD. The airport is operated by Avalon Airport Australia Pty Ltd, a subsidiary of logistics company Linfox. Avalon is currently served by passenger airline Jetstar Airways, which began domestic flights in 2004. AirAsia X began direct international flights between Avalon Airport and Kuala Lumpur on 5 December 2018. The airport is also the site of the biennial Australian International Airshow. Unlike Melbourne Airport, Avalon Airport is not governed by the Commonwealth Airports Act. The airport has a single runway in addition to a helipad. The airport is located on land of the original indigenous owners, the Wathaurong people, and a scatter stone area is preserved on the Avalon Airport site, out of respect for the original owners. The land has undergone many changes over the past century. In the beginning, the airport was a sheep and cattle farm and homestead, founded by James Austin, an immigrant from Glastonbury, Somerset, England. James established his farm and named the homestead "Avalon" after the isle of Avalon at Glastonbury, the mythical island in the Arthurian legend. In 1952 the Commonwealth Government bought 1,754 hectares (4,333 acres) at Avalon for just 110 pounds, as the land was deemed to be of poor quality farmland due to the abundance of volcanic rock littering the surface. The airport was opened in 1953, to cater for the production of military aircraft. Previously, the Government Aircraft Factories at Fisherman's Bend, Melbourne had used a runway beside the factory. However, newer jet aircraft required a longer runway for safe operations, and the Fisherman's Bend runway was being encroached upon by development. A 3,048 m (10,000 ft) runway was built by Country Roads Board, with the first plane landing on 3 April 1953 – a four-engined Avro Lincoln heavy bomber flown from Fishermans Bend. The English Electric Canberra light bomber was under construction at same time at the new airport. In 1959, Qantas established a training base at the site. In 1961, Government Aircraft Factories combined with The Commonwealth Aircraft Corporation, and built and serviced 110 Mirage fighters at the site, and in 1970 Jindivik Target Aircraft transferred to Avalon Airport from Fishermen's Bend, adding production of 170 Nomad and 75 Hornet military jets, in addition to servicing of other jets. In 1985 the Government Aircraft Factories changed its name to Aerospace Technologies of Australia (ASTA). Aircraft produced during this time included the CAC Sabre jet fighter, GAF Jindivik remotely piloted aircraft, and Nomad civil aircraft. Under the ASTA banner, engines for the Dassault Mirage III jet fighters were produced, as well as assembly of the F/A-18 multirole combat aircraft for the Royal Australian Air Force (RAAF). In October 1988, the ASTA Aircraft Services division took the first Boeing 747 to Avalon for servicing and maintenance. By December 1993, fifty 747 aircraft had been through the Avalon facility, and 820 people were employed at the site. October 1995 saw a Cathay Pacific Lockheed L-1011 flown to Avalon for scrapping by ASTA Aircraft Services, in what was a one off event. Training of pilots from Japan's All Nippon Airways commenced at the airport on 8 September 1993. On 27 June 1995 Aerospace Technologies of Australia was privatised by the Commonwealth Government, selling the aircraft divisions to Rockwell Australia Limited, and the airport operations to Avalon Airport Geelong Pty Ltd. The ASTA airliner overhauling facility was closed in 1997. The first scheduled passenger flights out of the airport were operated by Hazelton Airlines, who commenced flights between Avalon Airport and Sydney in February 1995. 36-seat Saab 340 aircraft were used for the service. The service was discontinued after a short time due to a lack of passengers. In 1997, the federal Government of Australia, through the Department of Defence, granted Linfox a 50-year plus a 49-year option lease of the airport. Between 1997 and 2001 Linfox developed proposals to develop the land which formed the basis of the Avalon Airport Master Plan draft, 2013. In 1992, the airport began hosting the Australian International Airshow. On 1 June 2004, Jetstar started commercial flights from the airport, in addition to their operations at Melbourne Airport. In April 2010, Tigerair Australia announced it would base two aircraft and commence operations from Avalon later that year. By June 2011 however, Tiger announced it would be withdrawing several flights from Avalon, to be operated instead from Melbourne Airport. The remaining Tiger Airways services were withdrawn after a series of incidents that led to airline's operations being suspended by the Civil Aviation Safety Authority the following month. In October 2012, the Federal Government announced that the airport's lease would be amended, allowing for the construction of a new terminal and the implementation of international flights. Avalon is the second airport in Victoria to be designated as a port of entry for freight operations. It was announced on 4 February 2018 that AirAsia X would move their Melbourne Airport operations to Avalon Airport by the end of the year. AirAsia X Airbus A330s will service the twice daily direct flights to Kuala Lumpur. On 9 July 2018, AirAsia announced that its operations from Avalon Airport would commence on 5 December 2018. An apron expansion completed to accommodate a further four aircraft as well as enable the opportunity to accommodate an aircraft the size of a Boeing 747. The current terminal facility is approximately 4,500 square metres (48,000 sq ft) in area and houses four gates capable of servicing aircraft up to and including the size of the Airbus A321. In its present configuration, the terminal can accommodate around six domestic departures per hour. The airport has a total of eight aircraft parking bays; there are six on the Northern Apron and two on the Eastern Apron. On the Northern Apron, the airport can accommodate five Code C Aircraft (Boeing 737 or Airbus A320 aircraft) and one Boeing 747. Avalon Airport can accommodate two Boeing 747s or two Boeing 787s on the Eastern Apron. The Eastern Apron is also a remote parking bay which doubles as a freight bay. The Airport is capable of fitting one Airbus A380 at a time on the Eastern Apron; this means it can also accommodate the freighter version of Boeing's new 747-8, which is slightly smaller. Currently the airport terminal is not equipped with aerobridges, and does not feature any guest lounges. The most notable freight operations include the Melbourne Formula 1 Grand Prix, V8 Supercars and Superbikes, plus some specialist charters including livestock race horses, fresh produce, military hardware, touring rock bands. The airport can facilitate loads on all aircraft types from the Airbus 380 series down, with equipment available to load via the main deck, lower deck, nose or tail end of the Aircraft, with a maximum lift of 16 tonnes. It has three dedicated freighter parking positions: Two on its Eastern and one on the Northern Freighter Aprons. Avalon Airport has six hangars in total: 55,000 square metres (590,000 sq ft) of hangar space, including three Boeing 747 hangars. Three of these are customised B747 hangars that were used by Qantas. The Qantas Engineering maintenance facility commenced operations on 13 May 1998. It was also responsible for the Qantas Group's aircraft commercial project work, including cabin reconfigurations and refurbishment. The Avalon Maintenance Facility was the first in Australia to develop and carry out a program for converting B737-300 passenger aircraft to freighters for Australian Air Express operations and was responsible for the modification of the new Premium Economy product for Qantas’ B747-400 fleet. In 2012, Qantas announced that it would phase out operations at Avalon Airport, making the hangars available for other businesses. 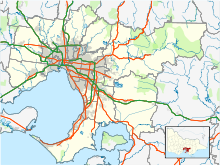 Avalon Airport is linked to Geelong and Melbourne by the adjacent Princes Freeway. The airport has 1,500 airport car spaces, a taxi rank and a ride-share pick-up/drop-off bay. In 2017, Skybus launched services from the Melbourne CBD and Geelong to Avalon Airport. The Avalon Airport Master Plan was prepared by Avalon Airport Pty Ltd in September 2015 and was endorsed by the Department of Defence. The document provides for a significant expansion of the airport's operations, as well as the establishment of non-aviation related developments. On 3 May 2011, the Victorian Minister for Public Transport committed $3 million for the planning of a rail link to Avalon Airport. In January 2013, three route options were presented. The railway line would start by running along the existing Geelong-Melbourne heavy rail corridor, and then divert towards Avalon Airport, south of Little River, at one of three locations. The eastern option would see the line break away closer to Melbourne, near Cherry Swamp Road and Little River. The central option would place the diversion 2.5 kilometres southwest, near Peak School Road at Lara. The western route option would divert from the existing line closer to Geelong, at Plains Road, Lara. Each of the three routes would run over the Princes Freeway, north east of the Beach Road interchange at Little River, running under the flight path to a new station inside the terminal. The government would need to acquire private farmland to complete the link and is considering a number different options, including a light rail service, automated driverless trains used at several international airports. On August 4, 2013, the state government indicated that it may alter its election promise to build the $250 million train line to Avalon Airport, and instead create a cheaper light rail link from Melbourne's south-west. Department documents show the government is now considering other options to meet interim demand, such as light rail, buses, or "driverless transport options which are used at many airports around the world". In July 2013, it was proposed by Geelong City Council that a theme park be built at Avalon, and they have held discussions with Village Roadshow and other companies concerning the proposal. African Safari World was a previous proposal at nearby Werribee Zoo that did not get approved. The biannual Australian International Airshow operates from Avalon Airport. The project is owned by Aviation Development Australia Limited. The event attracts a total attendance of over 195,000 across the six days, including exhibitors from the international aerospace industry and government, military, scientific and trade delegates. On 6 August 1976, a prototype N24 Nomad crashed shortly after take off at Avalon while a flight test of modifications to the tail of the aircraft. Two of the three crew members were killed in the accident, notably including pilot Stuart Pearce - father of actor Guy Pearce. A serious incident involving a Tiger Airways Australia Airbus A320 flight from Sydney occurred on 30 June 2011 when the crew performed a missed approach at Avalon outside of published procedures, resulting in the aircraft overflying the Geelong suburb of Leopold at a dangerously low altitude, without guidance from Air Traffic Control. The incident made national headlines and triggered a five-week grounding of the airline over a busy school holiday period while a safety audit was conducted by the Civil Aviation Safety Authority. ^ "Avalon Airport confident of a future even if Jetstar flights end - Australian Aviation". australianaviation.com.au. ^ "About Avalon". Avalonairport.com.au. Retrieved 18 August 2017. ^ "AirAsia and Avalon Airport to commence international flights". airasia.com. ^ "AirAsia X arrives at Avalon Airport". Australian Aviation. 5 December 2018. Retrieved 5 December 2018. ^ "HEROES OF THE SKY - AIRSHOW 2015 - AUSTRALIAN INTERNATIONAL AIRSHOW AND AEROSPACE & DEFENCE EXPOSITION - 24 February to 1 March 2015 GEELONG VICTORIA". Airshow.com.au. Retrieved 18 August 2017. ^ "Avalon Hangar Conversion for Qantas? Skybed Fit-Out Adds to Meinhardt Aviation Portfolio" (Press release). Meinhardt. 10 December 2003. Archived from the original on 29 August 2007. Retrieved 18 December 2007. ^ Fishwick, Bill. "Qantas Boeing 707-138 Aircraft at Avalon Airport in 1959". VH-JET#1 & Her Sisters. adastron.com. Retrieved 2 April 2013. ^ a b "Government Aircraft Factories / Aerospace Technologies of Australia". Boeing. Archived from the original on 9 June 2007. Retrieved 23 July 2007. ^ "AVALON LEADS THE WAY IN AEROSPACE, SAYS GUDE". Archived from the original on 28 September 2007. Retrieved 23 July 2007. ^ "Oddities – The Lockheed File". Adastron. Archived from the original on 12 September 2009. Retrieved 9 August 2009. ^ "The Demise of TriStar VR-HOF – The Lockheed File". Adastron. Archived from the original on 15 September 2009. Retrieved 9 August 2009. ^ "JAPANESE PILOTS' CAREERS SET FOR TAKE OFF AT AVALON". Archived from the original on 30 September 2007. Retrieved 23 July 2007. ^ "SUPERANNUATION (CSS) CONTINUING CONTRIBUTIONS FOR BENEFITS REGULATIONS (AMENDMENT) 1995 NO. 349". Commonwealth of Australia. Retrieved 23 July 2007. ^ "Property Council of Australia — Geelong Fights Back". Archived from the original on 28 September 2007. Retrieved 23 July 2007. ^ "GUDE WELCOMES GEELONG AIR LINK TO SYDNEY". Archived from the original on 28 September 2007. Retrieved 23 July 2007. ^ Platt, Craig (19 April 2010). "Tiger Airways to fly out of Avalon". traveller.com.au. Retrieved 15 August 2017. ^ "Tiger in Avalon-to-Tullamarine switch". Theaustralian.com.au. 3 June 2011. ^ "Avalon airport to become international". Theaustralian.com.au. 12 October 2012. ^ "Melbourne Avalon Airport to go international with Air Asia flights to Kuala Lumpur". ABC News (Australia). 4 February 2018. Retrieved 5 February 2018. ^ AirAsia to transition its Melbourne services to Avalon Airport December 5. AirAsia Newsroom, July 10, 2018. ^ "SkyBus is just the ticket as Victoria's second airport continues to grow". skybus.com.au. ^ "SkyBus now providing Avalon Airport – Geelong transfers". skybus.com.au. ^ "Avalon Airport gets green light for major development". geelongadvertiser.com.au. ^ "Avalon to become second Melbourne international airport, with rail link". Ausbt.com.au. Retrieved 18 August 2017. ^ "Three rail choices for Avalon airport". Heraldsun.com.au. Retrieved 18 August 2017. ^ "Home" (PDF). Transport.vic.gov.au. Retrieved 18 August 2017. ^ Tomazin, Farrah (4 August 2013). "Coalition may shift to Avalon light rail link". The Age. ^ Fowles, Shane (25 July 2013). "Theme park being readied for takeoff at Avalon". Geelong Advertiser. Geelong. Retrieved 29 July 2013. ^ "AIRSHOW 2013 - AUSTRALIAN INTERNATIONAL AIRSHOW AND AEROSPACE & DEFENCE EXPOSITION - 26 February to 3 March 2013 GEELONG VICTORIA". Airshow.net.au. ^ "AirAsia X schedules Melbourne Avalon launch in Dec 2018". routesonline. Retrieved 10 July 2018. ^ "Gold rush comes to Avalon with new daily flights". Jetstar. Retrieved 18 June 2015. ^ Airport, Avalon. "Flight Schedule". Avalonairport.com.au. Retrieved 18 August 2017. ^ "Accident description:VH-SUZ 6 August 1976". Aviation Safety Network. Retrieved 15 August 2017. ^ Crotty, D. "Government Aircraft Factories (GAF) Nomad". Museums Victoria. Retrieved 15 August 2017. ^ Gardiner, Ashley (13 July 2011). "Tiger flight flew low without clearance, Australian Transport Safety Bureau finds". news.com.au. ^ Sandilands, Ben (18 December 2013). "Safety report details breach that got Tiger Airways grounded - Plane Talking". Crikey. Wikimedia Commons has media related to Avalon Airport.